Where did R. A. Fox get his ideas on what to paint? 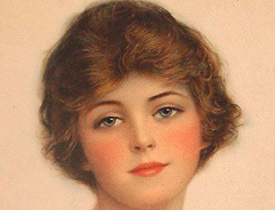 R. Atkinson Fox was a prolific artist painting many subjects ranging from animals, deco ladies, gardens, cottages, hunting and fishing, rural landscapes, rugged mountains and waterfalls, and portraits of historical figures. Name it, and Fox probably painted it. Why did Fox paint such a wide variety of subjects? The main reason is that he worked for many publishing companies who requested certain images they could use on calendars, fans, advertisements, books, or as framed prints. These were the images they felt the public would enjoy seeing and investing in. 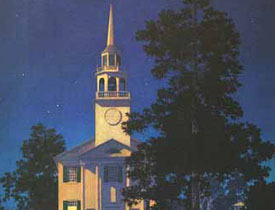 The majority of Fox’s paintings came at the request of the publishers. He would paint a scene, and then have the publisher approve it, or suggest changes. Fox would paint from his imagination but often utilized the photographs and artwork of other artists. Seeing the actual work of these other artists, plus information from the publishing companies leads us to the conclusion that it was the publishing companies whom asked Fox to paint a particular scene. One of the main sources of information comes from the archives of the Thomas D. Murphy Company. Photographs of various subjects have been discovered that were the exact, or very similar to those attributed to Fox. Thomas D. Murphy (and many others) would send Fox a photo from which he would paint the exact details of the model (whether it be a lady, cows standing in a row, elk, portraits of a historical figure, etc). Fox apparently had artistic freedom to paint the foregrounds and backgrounds as he chose, and would often use, bright colors such as those seen in at sunet or sunrise, or, the flowers surrounding the model. Why would the publishing company want Fox to copy from another artist? One reason is that the artist being copied would have been well-known and their art already appreciated. Quiet often the original work was done in either black and white or in a drab color. Fox would enhance the original picture by providing the bright vivid colors and perhaps a slight change in the scenery. The addition of color to the printing process in the late 1800s and early 1900s created a demand placed upon the publishers by the public. This was at a time when illustrations, not photographs, became desired. As was the practice of many artists of his time, Fox would vary the subject or themes of other artists. This of course does not take away the immense amount of artwork produced by Fox using his owns abilities. 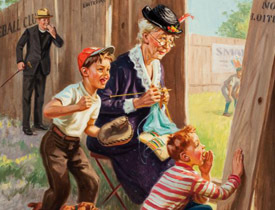 Fox painted many scenes from either suggestions from the publishers or from his own imagination. Here are a few examples of scenes that Fox copied. It should be noted this was done in the very early years of Fox’s career with the publishing companies 1900-1910s when Fox was in the process of being recognized as a talented artist. The first example is a scene of a maiden with two cows drinking at a water bucket . This was painted by France’s world-famous Julien Dupres. 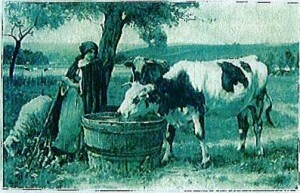 To the right is the painting by Fox with the exact two cows drinking from the same container. The leaning tree is similar but the remainder of the scenery is vastly different. The title of Fox’s image is “Dreamy Valley” and is under the name of Fox’s pseudonym Dupre. Perhaps this was the way in which the publishing company gave credit to the original artist by using his name? The majority of Fox’s work was used for advertising purposes – whether for calendars, advertisement, posters, or magazines. The framed prints were sold by the publishing companies for profit. 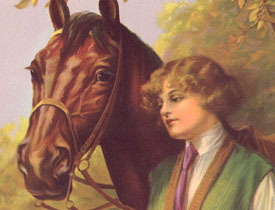 All the images produced by Fox were used for the benefit of the publishers. Below is the print attributed to R. A. 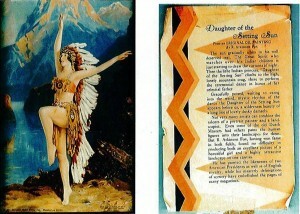 Fox titled “The Daughter of the Setting Sun.” On back side is the information “Helen Pauchaud Feature Dancer of the Celebrated Wright Dancers.” This may have been a salesman sample. This last example from the Thomas Murphy Co. (shown below) is a scene of a bull elk with his herd titled “The Victor.” The artist’s name is not clear but appears to be J. Decker. 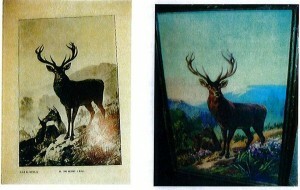 The second image is the enhanced scene painted by Fox with the title “A Brother Elk.” The elks are identical with slight changes to the surrounding landscape. This entry was posted in Article and tagged Article, Inspirations, R. A. Fox by Chris Wong. Bookmark the permalink. I’m looking for the “Fox” print “Friends” It is of 2 horses looking over a barn door and there is a mother cat and kitten on the ground in front of the door. Does anyone have this print for sale? I have a picture/painting is signed Da Forest in right lower corner. The bottom is printed A Bounty From Heaven. It is on thick brown like cardboard feeling. Has Weyenburg seal on the cardboard and has writing under picture of the two young children and they typed over it so you couldn’t see what it says.